It’s not uncommon for current bands to mine the 1960s for inspiration, but on Sonic Candy Soul, it’s like The Electric Stars have unearthed a full-blown musical from that era. In addition to catchy pop and glam rock tunes, there’s some blues, a gospel choir, and things get totally theatrical toward the end. It’s billed as Beautiful Music For Beautiful People, and at least 20 additional musicians or singers joined the five band members in creating it. 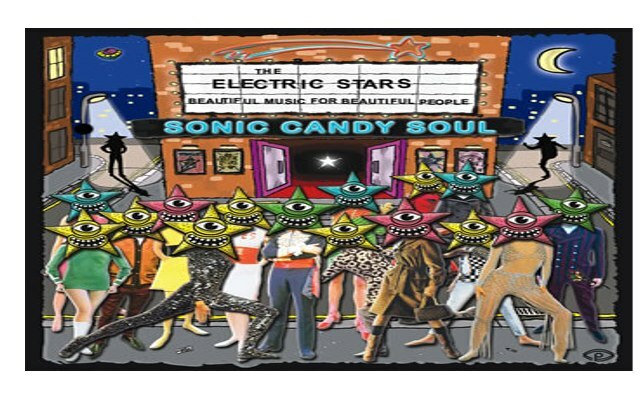 Some listeners are likely to find Sonic Candy Soul somewhat overblown and dated at times. But The Electric Stars, who hail from Manchester, England, mostly have a way of making 1960s style music fun. They did a fine job of covering “Jennifer Eccles” on the recently released Re-Evolution Hollies tribute album.